Front row (left to right): 1. Sebino Segundo, 2. unidentified, 3. Pete Szekely, 4. Tom Evans, 5. Carroll Sather, 6. unidentified, 7. unidentified, 8. unidentified, 9. Glen Jeffery. Second row: 1. Patty Stanford, 2. Ilene Rehder, 3. Pricilla Begonia, 4. unidentified, 5. unidentified, 6. unidentified, 7. unidentified, 8. Janice Austin, 9. Diane Heyden, 10. Kathleen Jones. Third row: 1. Chuck Varney, 2. unidentified, 3. unidentified, 4. Francis Caton, 5. Cathy Witbeck, 6. Lynn Erickson, 7. Judy Prator, 8. Joyce Fields, 9. Roberta Robinson, 10. Gary Norwood. Fourth row: 1. Mr. Lara, 2. Ron Mueller, 3. John Hughes, 4. Pete Zodtner, 5. Dennis Strieff, 6. unidentified, 7. Vernon Massey, 8. Jerry Flowers. Credits: From the collection of Peter Szekely. Thanks to Peter Szekely and Lynn (Erickson) Murray for identifying the kids in the picture. The kids in the picture are members of the high school graduation class of 1961. 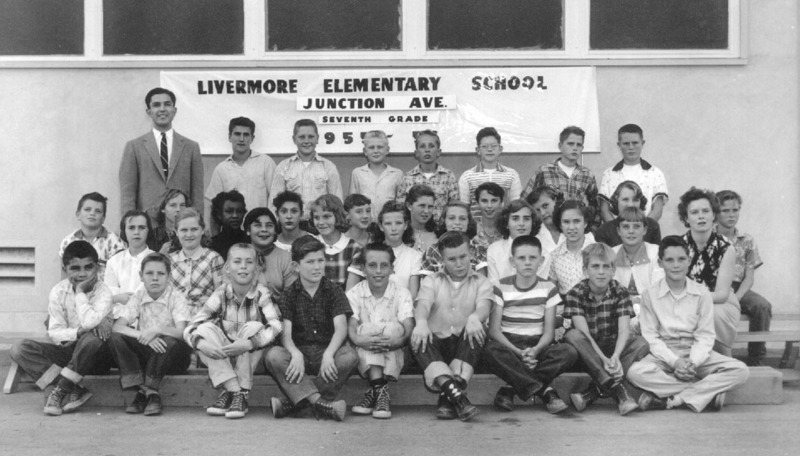 To find other pictures of the class of 1961 in the archive, see Livermore class pictures listed by year of high school graduation: 1961. And if you have any pictures of the class of 1961 that you would like to share, please submit them to the Archive.